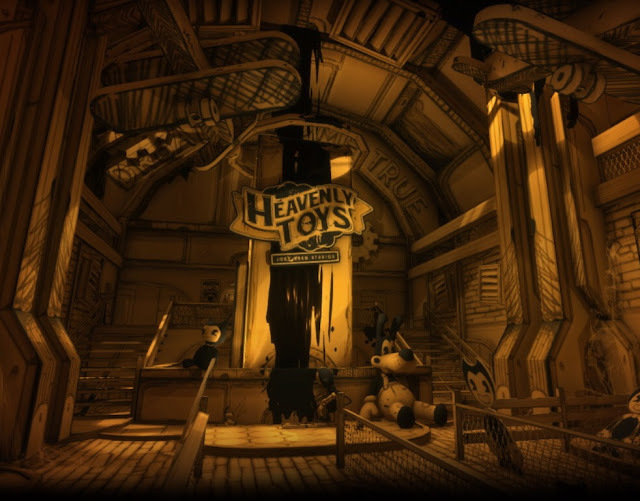 At first glance, Bendy and the Ink Machine seems like a sweet, darling game. The sepia-soaked inky world oozes with antique charm. I mean, it’s set in a cartoon studio for crying out loud — think early Disney. And it’s creator is TheMeatly, known for his webcomics with a distinctive style that is decidedly not spooky. Currently available as an episodic title via Steam, Bendy and the Ink Machine has three chapters available so far (the first one is free!) with the fourth on its way soon. Well over 6,000 players have rated the game on the “very” end of positive, and it’s got a huge — and amazingly artistic! — fan base on social media. Related reading: For a look at another highly, but very differently, stylized indie horror game, read Matt’s review of White Night for the PlayStation 4. Watch out for the names attached to the project, as I expect they will do great things in the future. Aside from the man behind TheMeatly, there is TheMeatly Games co-founder and Bendy programmer Mike Mood, 3D artist Dan Tozer, developer Matt Goles, and designer Gavin McCarthy. Watching the team grow slowly with Bendy and the Ink Machine’s continuing success has been an affirmation of up-and-comers to the video game industry.